Here are four fun getaways to explore for a few hours, or maybe the weekend. A selection of beautiful handblown glass at the Sandwich Glass Museum; the dunes at Sandy Neck Beach; cranberry bogs in Barnstable; walking the Sandwich Boardwalk; lobster rolls with a view at Fishermen’s View; a pirate welcomes you at the entrance of the Whydah Pirate Museum; french toast and bacon at Cafe Chew; boats docked at the marina in Sandwich; a seafood platter at Seafood Sam’s. Photography: (glass museum and boardwalk) Greta Georgieva (dunes, cranberry bog, pirate and aquaruim) William De Souse-Mauk; (marina) Rose Provencher; (lobster rolls) Fishermen’s View; (seafood platter) Seafood Sam’s; (breakfast) Cafe Chew. The coast is clear. Tourists are sparse, sweltering summer beach days are things of the past and, most importantly, there is no bridge traffic in sight. If you know, you know — but if you don’t? Well, bumper-to-bumper backup to cross over the canal and on to old Cape Cod, Massachusetts, stretches for miles in the summertime, with no end in sight. Insider tip: The transition from summer to fall is the perfect time to explore the Cape. The weather is still warm, the roads and sidewalks are not as crowded with summer tourists and there are plenty of fun happenings to keep yourself busy. Take it from me: A few years back, I lived on this little slice of heaven on Earth, through the summer, fall and (mellow) winter months. I worked in small shops, got to know some of the locals and saw the beauty that the Cape has to offer year-round. 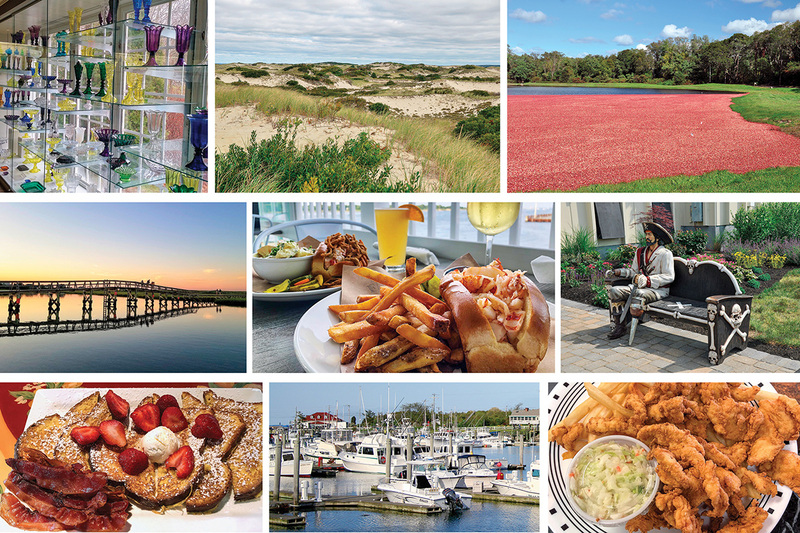 From seafood shanties to upscale waterfront dining to an autumn stroll on any number of the Cape’s fifty-plus beaches, I found some of the best spots for a post-summer day trip that’s worth the drive. By now our bellies are full of the ocean’s greatest harvests. We decide to walk off our pick of the sea with a quick jaunt down the road at the iconic Sandwich Boardwalk. We make our way from the parking lot over the marsh on the suspended narrow bridge and towards the sound of the waves kissing the shore. The smell of the salty ocean air draws me close; we make our way up over the sand dunes and I sigh with a smile at the picture-perfect seaside scape. I look at the intricate little details of the glass ornament I purchased; the sight of a wave crashing into the abyss of the ocean is a small farewell to our day spent just over the canal. As we cross back over the bridge to the mainland, I twirl my keepsake so that the cast of the golden sun hits the glass just right. I will keep it up in the window of my home until next year, when I return once again to old Cape Cod with no throngs of people and no traffic in sight. Don’t miss: Sandy Neck Beach Park. Warm summer days aren’t the only requisite for a beach day. Throw on an extra layer and take a stroll along Sandy Neck Beach. The smell of fresh salty air and the sight of dunes that travel as far as the eye can see are a sweet reminder of summers past. 425 Sandy Neck Rd., West Barnstable, Mass., 508-362-8300, town.barnstable.ma.us. Worth a detour: Woods Hole Science Aquarium. Woods Hole, which lies in the extreme Southwest corner of the Cape, features the Woods Hole Science Aquarium. It is home to approximately 140 different species of marine animals found in Northeast and Middle Atlantic waters. Visitors can watch staff feed the animals, clean tanks and work on the life support systems. The aquarium rehabilitates and releases cold-stunned turtles and provides a permanent home for stranded seals that cannot be released to the wild. 166 Water St., Woods Hole, Mass., 508-495-2001, aquarium.nefsc.noaa.gov. Closer to home: George’s of Galilee. If you like seafood, George’s of Galilee is your oyster. Overlooking the Block Island Sound in the port of Galilee, this seaside restaurant serves boat-to-plate seafood fare straight from the docks. Don’t dismiss the clam cakes and chowder! 250 Sand Hill Cove Rd., Galilee, 783-2306, georgesofgalilee.com.